Description - The marmot is a large animal this is silver-grey above with a brownish rump and whitish belly. Distinct black and white marks are on the head and shoulders. 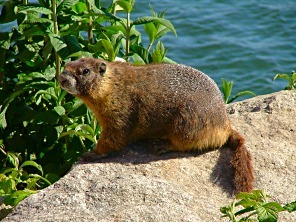 The tail of the marmot is large, reddish-brown and bushy. Average weight is 8-20 pounds. Distribution - This species of marmot lives throughout all of British Columbia in talus slopes in the mountains. Biology - Marmots feed almost entirely on greens. In May, 4-5 young are born. When in danger this animal gives off a shrill, piercing "Eeeeeee" alarm hence the nickname "whistler". 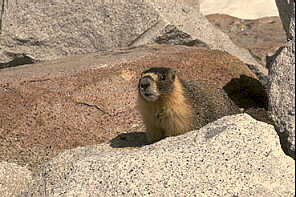 Many carnivores prey on marmots; bears may dig up marmot that are still hibernating in the early spring. Photo courtesy of Michael Wigg.